This image was taken of a region in Chryse Planitia where Tiu, Ares, and Kasei Valles end. This relatively flat region is pockmarked by impact craters large and small. This image contains the side of one crater that is about 5 kilometers in diameter, several closer to 1 km, and many that are smaller than 100 meters. In the large 5 km crater, layers of rock are exposed in the crater wall. This is not surprising, given that Tiu, Ares and Kasei Valles all probably dumped tremendous amounts of sediments here, and each of the layers may represent sedimentary layers. Rays of ejecta are observed in radiating out from the large crater. There is also a younger small crater about half-way down, on the right side of the image that has dark ejecta rays still preserved on the surface. Pit crater chains, in contrast, are not formed by impacts, but by the collapse of material into a void. 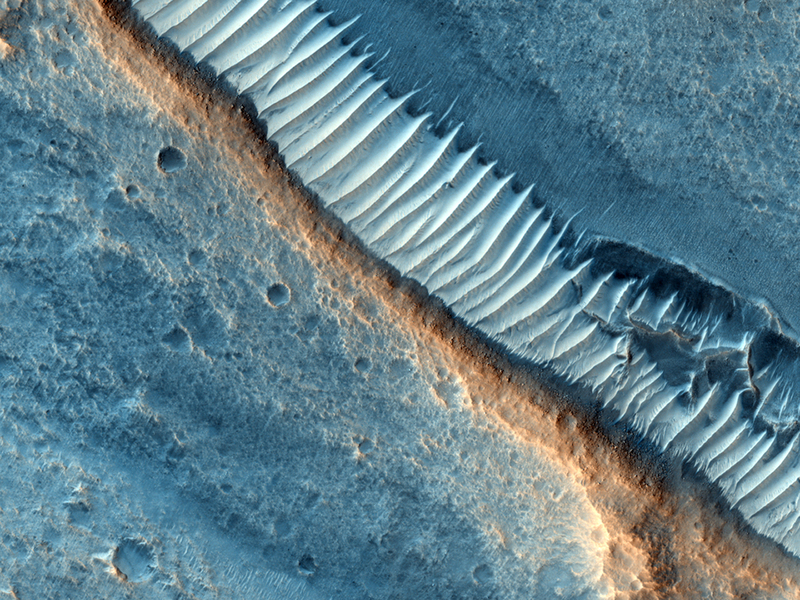 In the center of the image is a pit crater chain along the linear feature. This linear feature is a graben, which is a block that had dropped down between two parallel faults. Pit chains commonly form in grabens, where there is collapse of material into the subsurface void. This is because this is an area of extension, or pulling apart of the crust. 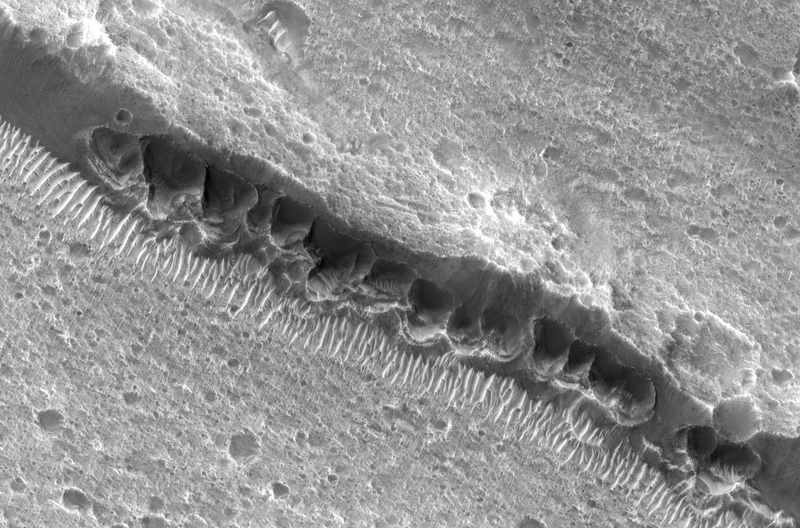 Pit crater chains are also observed associated with lava tubes in other locations on Mars. So these holes in the ground are distinctly different from the craters caused by impacts visible in the rest of the image.